There are three options to purchase TAYO Issue Five. + TAYO Five is available at national Barnes & Noble retail stores (click here for a detailed list) for $18.00. Please head over to B&N to purchase a print copy today! + TAYO Five (Digital Version) is available for $5.00. You may purchase the digital version below. Please note: the download link will expire within 24 hours of your first access. + TAYO Five (Print-on-Demand) is also available on Amazon.com; however, the price is more expensive due to print-on-demand's printing costs ($35.00). If you'd like to purchase the cheaper $18.00 issue, please visit your local Barnes & Noble retail store and buy your copy today! 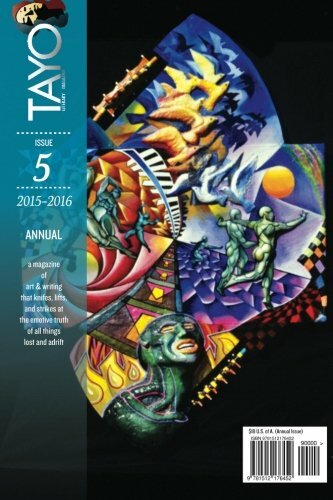 You may purchase TAYO Issue Five at national Barnes & Noble stores for $18.00. Click below for a list of national Barnes & Nobles retail stores that carry TAYO Five. If you would like to add TAYO Five to your local B&N or have any other questions/concerns, please email us: tayoliterarymag [at] gmail [dot] com.